Jeanette Larson’s path to Mountain View, Arkansas and her job as the craft director at the Ozark Folk Center has been as winding, steep and bumpy as the local roads, but her path has a fiber artist has run straight through her life. Jeanette learned to crochet from her grandmother when she was eight-years-old and has rarely put down her crochet hooks since then. She crocheted while on the bench during high school basket ball games and in lecture halls in college. “Crocheting helps me relax and keep still while letting my mind work on things,” she said. Her mom is a talented seamstress who made many clothes for Jeanette and her two brothers. “I learned all the basics of fabric manipulation, fiber behavior and pattern piecing from watching my mother,” said Jeanette. When Jeanette was 12-years-old she visited her Aunt Jeannie in Boston. Jeannie was learning to weave and Jeanette learned right along with her. Twenty-five years later, Jeannie was going through some life changes and was looking for a home for her looms. She sent her Schacht rigid heddle and 1929 Newcomb rug loom to live with Jeanette. In 1981, while at Colorado State University, Jeanette began milking in the college dairy. This lead to a life-long love of dairying and in 1982, dairy goats became a permanent part of her life. Having a small farm for the goats led to sharing that life with other animals, and sheep became a natural part of the mix. Starting a family didn’t interupt her straight line journey in developing her fiber arts. In 1987 she juried in to the Colorado Renaissance Festival. Both her chlldren grew up there, spending every summer in the RenFest booth. She won several awards over the years, her favorite was the “2006 Best Artist” award. 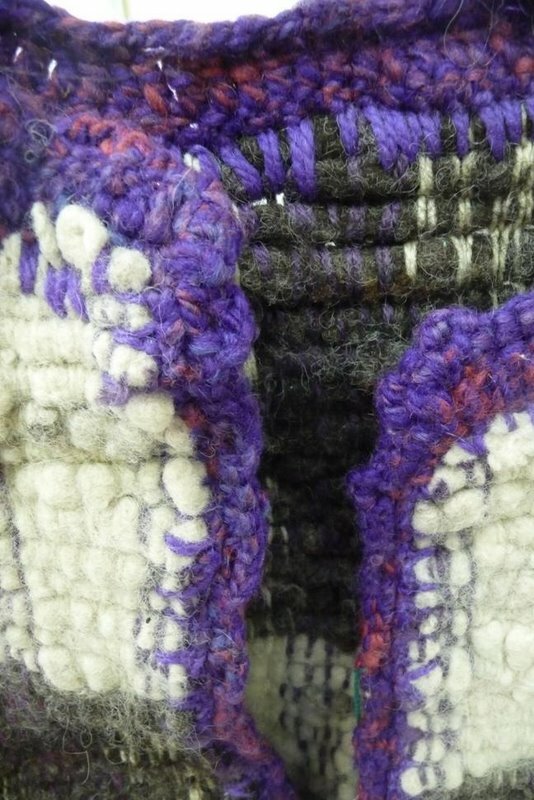 She’s also won awards for her crochet, weaving and design at the Best of the Southwest Wool Festival in Farmington, NM; Wool Festival at Taos; Estes Park Wool Market; and the National Western Stock Show. 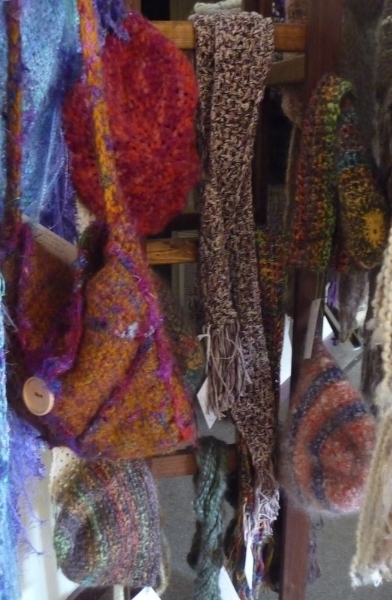 She juried into fairs and craft shows from Utah to Louisiana over the years and developed her own distinct style that combines weaving, crochet and a variety of fibers, mostly natural and home-grown. Professionally, dairy management; providing day care for children; rural postal carrier; fairgrounds management; free-lancing for magazines; working as a reporter; photographer and ad salesperson have all been parts of her life. 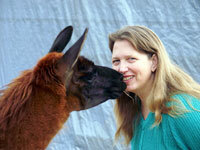 By 2000, Jeanette was the managing editor for a small agricultural publication group. About that time, all the facets of her life began their push to send her to Mountain View. In 2002, Colorado experienced the worst drought in recorded history, inclucing tree-ring history. Only two-and-a-quarter inches of rain fell on her small farm on the Colorado plains that entire year. Water rationing was strict throughout the state and feed prices soared. Jeanette and her partner, Shawn Hoefer, began looking for a less crowded state that was more suited to farming. In 2004, Joe Jewell, a long-time Mountain View resident, spent the summer at the Colorado Renaissance Festival playing his hammered dulcimer in front of Jeanette and Shawn’s Common Threads booth. He told them of a wonderful land called “Arkansas” where water falls out of the sky and wood grows on trees. Shawn, a wood worker and fiber arts tools designer, knew better. Wood is a very expensive material that you buy in stores. But, they were intrigued and juried into the Bella Vista Craft Show. It was really love at first show. The people were fascinated and friendly; the land was beautiful and lush; there were more types of trees that you could imagine and the couple had their second best show of the year, sales-wise. In 2006, they visited Mountain View. Joe had told them about the Ozark Folk Center. From before the first visit it was obviously fate. Now, as the craft director of the Ozark Folk Center, Jeanette fits her spinning, weaving, crochet and design time into the edges of her day. 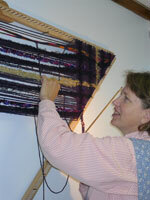 Fiber art is still the common thread that ties the rest of her busy life together.